General Info: Plovdiv is one of the oldest towns not just in Bulgaria, but also in whole Europe. This is the second largest city in Bulgaria, after Sofia. It is situated in the western part of the Gorno Thracian lowland, on the two banks of the biggest river in Bulgaria - Maritsa and on top of six unique syenite hills- “tepeta”. The city is situated 150 km east of the capital of Bulgaria - Sofia and 270 km west of Bourgas. Layers of cultural treasures from prehistoric, Thracian, roman, Byzantine, Ottoman and revival periods can be found in the region. Today Plovdiv is a modern city with fast developing business centre. Many new administrative buildings and trade centres and numerous companies and enterprises have offices in the city. History: The oldest inhibitors of the region are from the new stone, stone- copper and bronze epoch. During the first millennium before Christ the settlement Evmolipias, named after the mythical king Evmolp, rises in the region of the three hills- Djambaz tepe, Taksim tepe and Nebet tepe. The tree hills form a natural protection against invaders. Phillip Makedonski, the father of Alexander Makedonski, is considered to be the official founder of the city. In 342 he conquers the city and names it Philipopol – “The town of Philip”. The Macedonian ruler builds a brand new city with remarkable public buildings, temples and a stadium. Today just next to the ancient stadium stands the statue of Philip II Macedonian, made by the sculptor Cyril Naidenov. The death of Alexander the Great marks the end of his empire. During the period 1-3 century before Christ, the city suffers from numerous attacks from the Celts, who call it Pulpudeva. In 45 year after Christ the lands between Stara Planina (The Balkan Mountain range) and Aegean Sea were a roman province called Thracia, and the town was renamed to Trimontium – “The three hills”. After the end of the Roman Empire the town becomes a strategic fortress of the northern border of Bysantium. The Slavs that settled in the region call it Puldin. In 815, khan Krum adds it in the territories of Bulgaria and calls in Plovdiv. Plovdiv stands deep in the back areas of the Ottoman Empire under the name Felibe and slowly loses its strategic significance. However, after the Renaissance epoch it again becomes and important cultural and economy centre. The craftsmen and tradesmen class are created. Great poets, writers, painters and icon writers lived, worked and created masterpieces in the town. In 1870 a revolutionary committee was summoned in the town. Many Renaissance houses and buildings are now announced to be architectural monuments and are transformed into museums. Plovdiv was freed from ottoman rule on 17th January 1878, by Gurko general and becomes the biggest town in Bulgaria. After the Berlin congress it becomes the capital of eastern Rumelia. On 6th September 1885 the SYEDINENIE of Bulgaria is announced in the centre of Plovdiv. Maritsa River divides the city in two different parts. The smaller part hosts the fair town with the official address 37 “Tsar Boris” blvd. The first fair in Plovdiv took place in 1892 and later it was renamed to The International Plovdiv Fair. Now it is opened twice a year- in May for consumption goods and in September for industrial goods. Attractions: Plovdiv is a colourful and picturesque city. Many centuries Bulgarians, Turkish, Armenians, Jews, Greeks and Romas live together in the city. A short walk around the local temples will prove that. Except for the Bulgarian Orthodox churches like “st. Dimitar”, “Holy Mother”, “st. st. Constantine and Helena”, tourists can also see the catholic temple “st. Spirit”, the protestant church, the Armenian Church “Surp Kevork”, the Ancient Sinegogue, Djumaya mosque, the Dervishki monastery “Melevi hane”, whose remains can be seen in the ground floor of “Puldin” Restaurant and etc. Guests of Plovdiv can try all kinds of entertainments. The central streets are live, night clubs offer unforgettable moments for those who like clubbing. 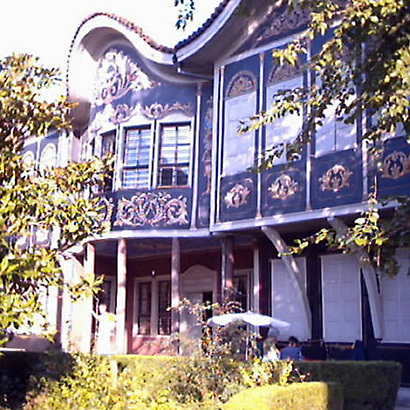 The architectural reserve - The Old Plovdiv is a site with unique atmosphere. Each one of the buildings there has its own history and silently tempts you to feel it. It is no wonder that one of the greatest Bulgarian poets, Dimcho Debelyanov often writes about the city in his beautiful melancholic strophes. The cosy restaurants and mehanas in the complex will make you feel the typical revolutionary atmosphere and you will long after that remember the taste of traditional Bulgarian dishes, served with desire. The Ancient Landmarks: At the foot of Djambaz tepe and Taksim tepe are raising the columns of the Ancient Theater. If you sit on one of the 28 rows of stone seats during sunset you will easy be able to imagine the ancient tragedies and gladiator games that used to be performed on the scene. 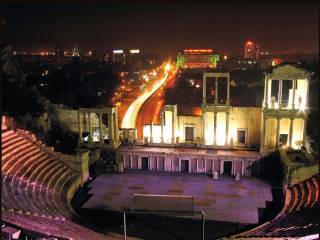 Because of its thousand year history, the attractions in Plovdiv are countless. Remains from ancient aqueducts, bringing clear spring water by the Rodope Mountain to the town can be seen. The archeological and ethnographic museum will let you know more about the history of the town and its citizens. A day or two are surely not enough to see all of the landmarks in the city. 30 kilometers away from Plovdiv Bachkovo monastery is situated. It is the second largest monastery in Bulgaria. It is hard to talk about its beauty and charms. Only those who visited Plovdiv can really feel its spirit. Welcome!